Mindfulness is somewhat of a buzzword right now. And naturally, when such a thing becomes more mainstream, a host of websites spring up around the subject. While this is great, it can make finding the best ones slightly, ahem… challenging. So to help you out on your road to mindfulness, here are 7 of the very best ones out there. The very simply named, Mindful, is a great website for both those new to the concept and for those wishing to further their knowledge. A non-profit organisation that also provides a printed, bi-monthly magazine, the Mindful label is partnered by The Hemera Foundation (a philanthropic organization) and The 1440 Foundation who were pivotal in the setting up of Mindful, and helping it get to where it stands today. In Mindful’s own words, this is ‘the place to go for insight, information, and inspiration to help us all live more mindfully’. Mindfulnet bills itself as ‘everything you need to know about Mindfulness on one website’. And we have to say, it really does do as it says on the tin…! One of our favorite pages on this website is the one labelled, ‘research’. The clue is in the name, with loads of information about many of the research papers that have been written on the subject. The site is easy to navigate, and for those who like a bit of science behind their reasoning, then head to the ‘Neuroscience’ page, where you can read some more in-depth (but still in layman’s language) information on how Mindfulness really can help with the way the brain works, improving cognition, etc. 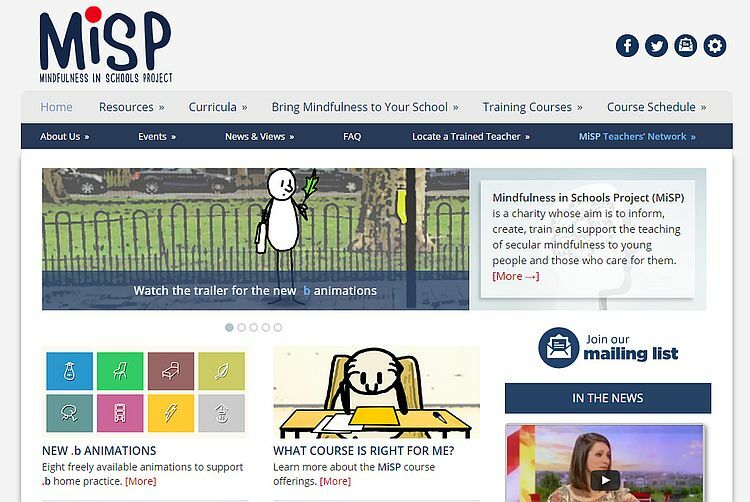 The website, Mindfulness in Schools ,is a wonderful resource for anyone who believes that Mindfulness can be truly beneficial for young people in their formative years. This not for profit company is dedicated to training adults to be able to teach Mindfulness within the education environment. To this end, they’ve created different adult education courses that will equip those who follow them with the ability to educate young people of varying ages (different courses for 7-11 year olds and 11-18 year olds) into the mindset of being Mindful. Mindfulness in Schools was originally set up in the UK. But such was its popularity that there are now multiple courses and teachers around the world – with many located in the US. The American Mindfulness Research Association has been around since 2013, and is a rational, science-led, practical website on everything you could hope to learn about the concept of Mindfulness. In addition to being a great information resource, the association also plays an active role in facilitating the discovery and personal development of individuals and institutions through the giving of grants. You can also subscribe to the association’s monthly newsletter to keep bang up to date with the latest research behind the practice. Don’t want, or have the time, to get bogged down in pages and pages of online information? Then head over to Pocket Mindfulness, the blog and website of Englishman, Alfred James. This qualified life coach and student of Eastern philosophy provides bite sized ‘pockets’ of information that can help you on your pathway to inner peace, self-acceptance, and contentment. If you love the website (and we’re pretty sure you will), there’s also a Pocket Mindfulness App available for iPhone, that’ll deliver even tinier bite sized chunks of daily inspiration directly to your cell or tablet. Tiny Buddha offers a multitude of different ways to take advantage of their Buddhist based Mindfulness information. There’s a blog, an active forum, books and courses, and if you subscribe you’ll get a daily email jam-packed full of useful info to read. The ethos behind the site is that while there’s an incredible amount of information out there (that’s not the problem)…, the issue is to find the time to apply the wisdom we learn. The guys at Tiny Buddha are all about how to reflect on this simple wisdom and to learn how to apply it to our complex lives. Nearly three million people follow this website and blog, making it one of the most popular Mindfulness websites out there today. Elephant Journal, or – as they refer to themselves – Elephant, provides mucho information about everything to do with living a Mindful life. Think yoga, enlightened education, contemplative arts, sustainability, organics, family, conscious consumerism… You name it. If it’s got links to improving your Mindful life, then you’ll find it here. Elephant started off as an independent printed magazine. But they’ve evolved into a (still independent) online publication that you can dip in and out as much or as little as you please. You can also sign up as an Elephant member (costing $2 a month), for even more Mindfulness info direct to your inbox.